After a day of useful presentations and interesting conversations in Manchester, I returned to the Lakes with a new phone for the second leg of the May tour. The first leg had been pretty successful with 15 Wainwrights in 3 days, not a bad average. But I still hadn’t reached 100 and the weather forecast didn’t give much hope, describing conditions as “changeable”, which in Lake District speak means “raining most of the time with a few dry spells”. Under the circumstances it seemed like a good idea to plan for bagging a few outliers and low-hanging fruit. As it happened, the Friday didn’t look too bad, so I decided to take on another of Stuart Marshall’s walks in an attempt to finish off the Far Eastern Fells, a Troutbeck Medley. The word “medley” is used here to mean a walk taking in a number of tops that have no geographical relation to one another save that they are all close enough together to make the walk possible in a long day. In other words, a walk that no right-minded person would do. Which, I think says more about my determination to wrap up the Far Eastern Wainwrights than it does about wanting to actually enjoy the endeavour. Parking at Troutbeck is limited and the small parking area was already full when I arrived but I found a useful lay-by on the A592. I got my boots on and quickly found the footpath up to Sour Howes. The morning was cloudy but dry and the gradient (for once) not too taxing. I reached the hummocky plateau in good time and then started on the difficult task of trying to work out which of the many hummocks was the actual summit. After a few ups and downs I chose the one I thought might be the highest and discovered a pathetically small pile of stones on the top. 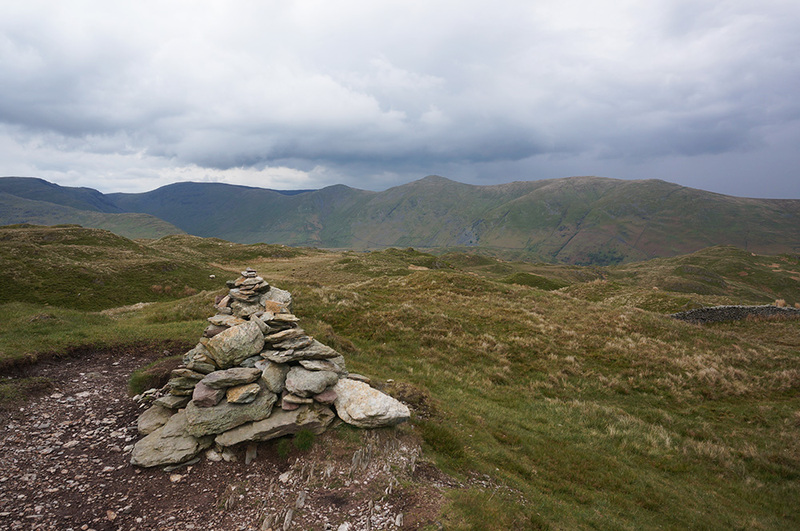 The best fells have an obvious summit, ideally pointy and with a generous cairn on top. Sour Howes is not one of those fells. However, from the “summit” there was a clear view of the route to the next top on this walk. Sallows is the fell I was tempted to bag from the Garburn Road on the way out from Kentmere earlier that same week and I was now glad that I hadn’t because from here, it looked like an easy take. There’s very little height loss and gain between Sour Howes and Sallows and at a distance of under a mile, this was a gentle 20 minute stroll. When I arrived at Sallows, there was a group of 3 old boys sitting at the summit, passing the time of day and surveying the scene. We exchanged pleasantries, considered the likelihood of rain later in the day and then they continued on their route, understanding (I think) that everyone has the right to some private time at a fell summit. Not for the first time, I hoped that I’d still be walking the fells when I reached their age. I didn’t know it yet but I’d just used up all my easy walking credit for the day; the rest of the walk was going to be a bit of a chore. Looking across Troutbeck to Wansfell on the descent from Sallows. I had a quick lunch and headed down to the Garburn Road where I’d been a few days before. I found the location from which Stuart suggests that “…the route leads down steeply over grass…”. Naive, I know, but I had assumed that there would be some evidence of a path, even a faint one. I found nothing of the sort and eventually realised that I’d just have to head off in the right direction and hope for the best. The going was difficult but I could, at least, see my destination and after a few deviations do avoid steep dips and streams, I eventually arrived at a gate in an intake fence. I went through the gate and in a little while, a track developed, which lead down to the well-maintained track (this area is in the ownership of the National Trust) leading up the Troutbeck valley beside Hagg Gill. I passed the disused quarry and crossed Hagg Gill, ready for the next climb. To be fair, Stuart Marshall says, “…take a deep breath and climb the precipitous eastern flank of The Tongue…” and he wasn’t kidding. It is a very steep climb and I hadn’t experienced anything like it since I climbed the north ridge at Middle Dodd. Again, there’s no obvious path here and I found myself zig-zagging from one sheep trod to the next. 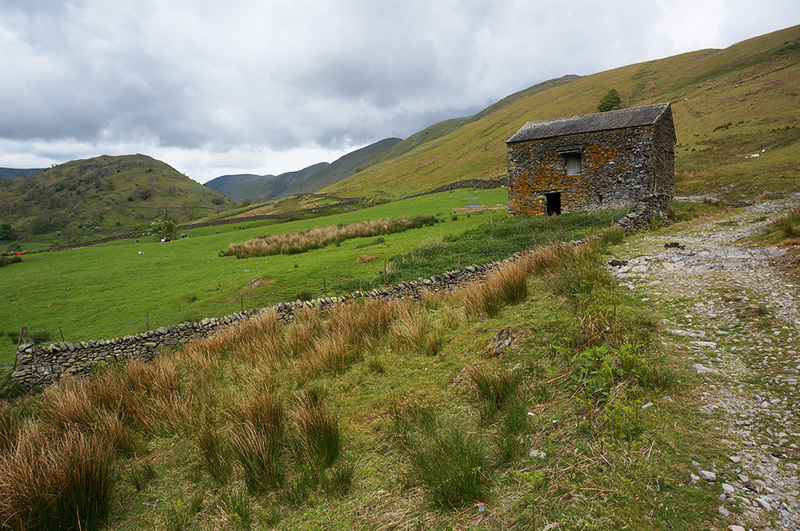 A field barn on the bridleway alomh Troutbeck valley en route to Troutbeck Tongue. Eventually, I made it to the top. The first thing that struck me was the view across to Wansfell and the realisation that I was going to have to lose over 200m in height and then gain over 300m in order to get there. A light rain began to fall and for a moment, I considered bailing out and short-cutting back to the car. 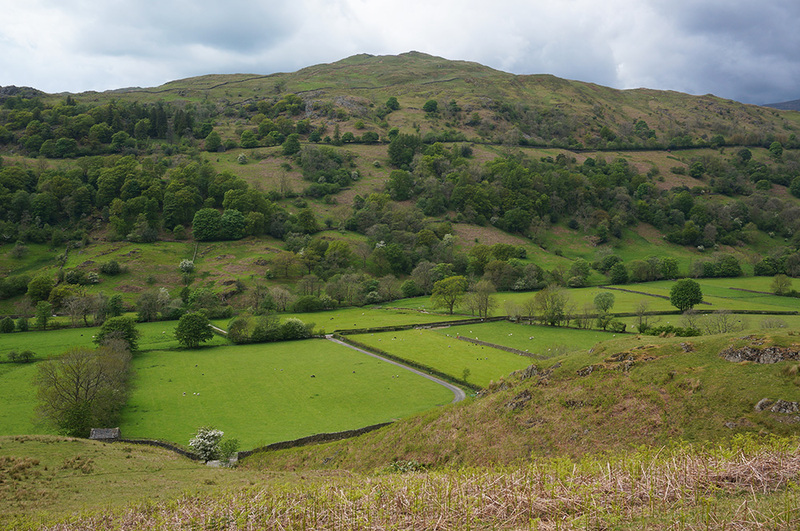 I took the steep path down to Troutbeck Park and thought only of getting to Wansfell. Following the route, I came to a gate marked “Private”. I stopped, checked the map and checked again. Yes, this was the correct route and yet… Normally, I would avoid doing so but on this occasion, I went through the private gate and climbed a steep field to the public bridleway. This short section of the route was the most pleasant of the day as the bridleway more or less followed the contour and for once I found myself neither steeply climbing nor dropping. Sadly, it was all too brief and I was soon at the Kirkstone Road. I walked back along the road to the point where I was to strike off and could only find a padlocked gate. Not for the first time on the walk, I double-checked the map and decided that this was, indeed, the route described in the book. I waited for a break in the traffic and climbed over the gate (not something a bloke in his mid 50’s should be seen doing!). Another steep, pathless climb lay ahead but I did have a wall to follow for some of the way. Eventually, the wall dog-legged west and I continued upward and vaguely in the right direction. 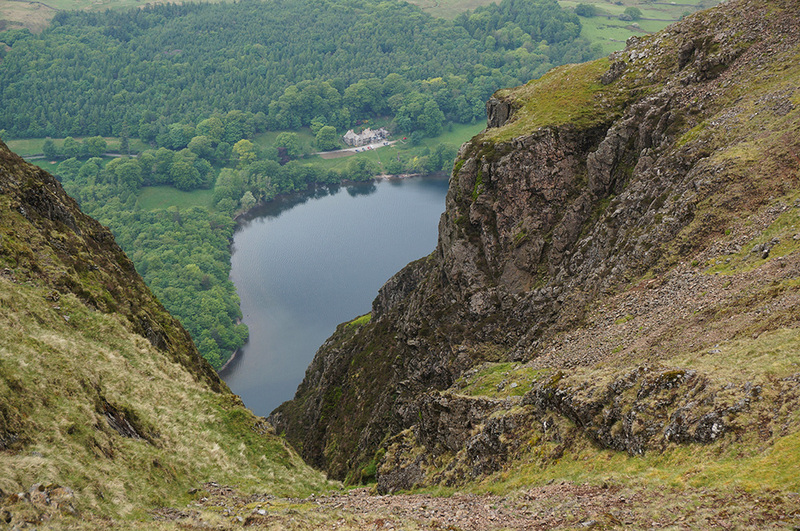 As I approached Baystones (the Wansfell summit) I entered an area with a confusion of stone walls, which bore no obvious relation to those shown on the OS map and it became clear that I was not going to reach the summit without climbing over a wall. Again I wouldn’t normally do this but, by now, I was beginning to wonder whether anyone had actually walked this route before, and decided just to go ahead and find the best (easiest) place to climb. Shortly after the wall, I was at Wansfell summit and, seeing a clear ridge route to Wansfell Pike, wondered if that was the end of the unmarked routes for the day. As it happened, it was. By the time I reached Wansfell, I was feeling pretty jaded and thought about missing out Wansfell Pike and taking a more direct route back to the car at Troutbeck. After all, Wansfell Pike is not a Wainwright, so I wouldn’t be missing anything other than a view. I had a short break and decided that, having completed so much of this “medley”, I might as well finish it off. And in any case, I had something to celebrate. I’d just completed the Far Eastern Fells. What better way to celebrate that to bag another top just for the hell of it. The summit cairn at Wansfell looking north-east to Ill Bell. I really enjoyed walking the clear and almost level ridge route and the easy going felt like a reward for all the earlier hard work. Twenty five minutes later I was at the Wansfell Pike summit cairn and looking at the most complete view of Windermere it’s possible to get. While I was at the top I saw three figures approaching on the Ambleside path. They waved and shouted a welcome – clearly not English then. They turned out to be two Spanish nurses and Chinese guy who had met en route. All three were staying at YHAs, the two women at Ambleside and the guy at Windermere. They told me they’d been walking for 4 hours and were following a route on a crude map they’d been given that took them to Troutbeck and then back to their respective hostels. I reckoned that at their rate of progress, they’d need another 5 hours to get back but it was already after 5 and they probably had 4 hours of daylight left. However, they were in good spirits (which I wasn’t prepared to dampen) and they headed off towards Troutbeck leaving me to my rest. A little while later, I followed on the same path and could soon see them ahead of me looking puzzled and slightly lost. They waited for me to catch up and asked me if I knew how to get to Troutbeck. At this point, I realised they were never going to make it back before dark so I suggested that we walk down to Troutbeck together and that I should give them a lift back to their hostel. Under the circumstances, they agreed that this was probably a good idea, so we set off with me leading the way. 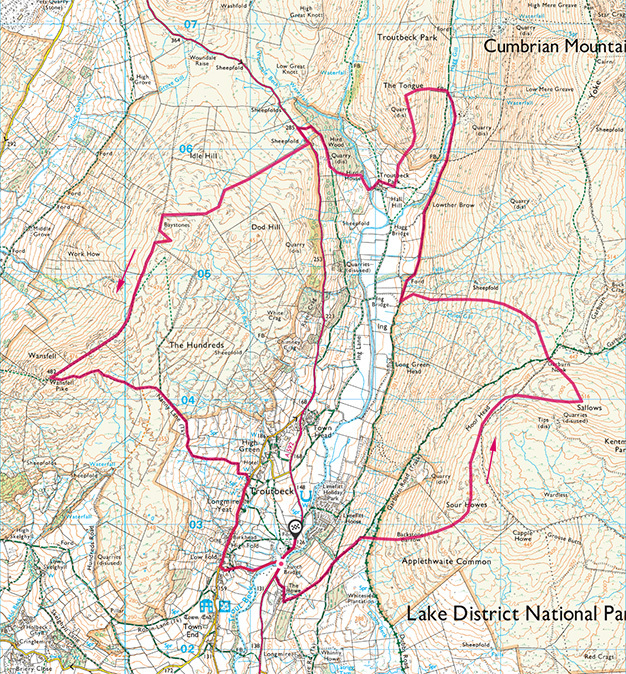 A Troutbeck Medley (16.5km and 1065m of ascent). Start/end: Lay-by (A592) near Troutbeck. On the way, one of the nurses, whose English was better than the other, explained that they were specialist intensive care nurses working in Manchester and had been in the UK about 12 months. They were pleased to be here because there was no work in Spain. I kept it to myself but wondered how on Earth the NHS was going to cope once people like these were sent home after Brexit. The Chinese guy had been educated in the States and was currently on a whistle-stop tour of Europe. Today was his Lake District day and tomorrow he was off to Edinburgh. I’m not sure how much a sense of a place you can get in one day but he seemed pleased to be on the move. We got to Troutbeck and (amazingly) found a bus a few minutes after we arrived that went to Windermere, so the Chinese guy took that and I drove the two Spanish nurses to the hostel at Waterhead. It was on my way anyway since I was staying at Patterdale. They were very grateful and slightly relieved and I felt I’d done a good turn. Having completed the Far Eastern Fells and the third of the first three Wainwright books, I moved on to Book Four, The Southern Fells. I had a couple of day walks planned but the weather was pretty unpredictable so I elected to knock off a few of the lower outliers. First up was Lingmoor Fell. I drove down Great Langdale and around to Blea Tarn, parking in the small car park, overlooking the tarn. The route up was clear and as I climbed, there were great views to Side Pike and across to the Langdale Pikes. However, weather was moving in fast and the Langdales soon disappeared, shrouded in mist. It began to rain and the wind got up. Two thirds of the way up I found a small hollow, screened by Rowan trees in which to shelter from the wind and rain. I waited a while but it became clear that the weather was unlikely to ease any time soon so I continued for Brown How, the summit. When I arrived, the wind make it difficult to stand upright and get my customary photo of the cairn and the rain just battered down. 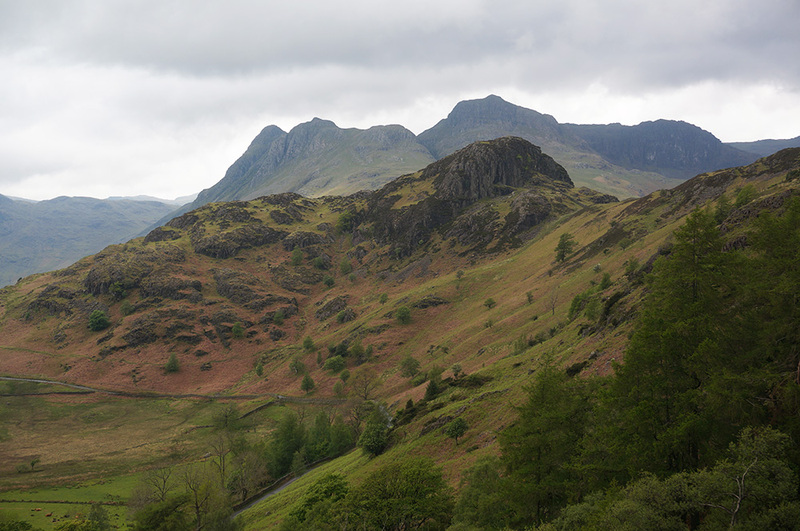 The Langdale Pikes were just a grey silhouette. 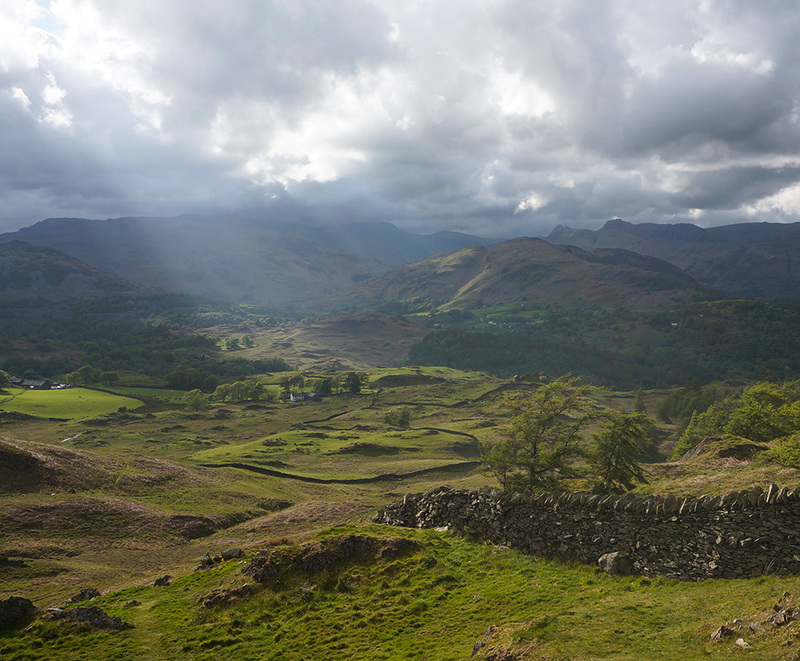 Side Pike backed by the Langdale Pikes from the path to Lingmoor Fell. I didn’t linger, having got my photo of the summit, I beat a retreat, taking the more direct route back to the car park. As often happens in these situations, the weather gradually improved as I descended and by the time I got back to the car, it was almost cheerful. I went to Ambleside for lunch and waited for the bands of rain to ease before heading off to Tarn Hows where I was aiming to bag my 100th Wainwright, Black Fell. It was a very pleasant evening and the walk from Tarn Hows car park took under an hour. I was in no hurry and was just hoping for some quiet time at the summit to celebrate my achievement. When I arrived, there was a stiff breeze and although there was plenty of cloud, there were also plenty of breaks and a shifting lightshow as the sun lit up the landscape like a roaming spotlight. A lightshow over Lingmoor Fell, backed by the Langdale Pikes from Black Fell summit. Black Fell has a very satisfying summit, known as Black Crag. There’s no ambiguity here, a well-built trig column sits atop a rocky outcrop and for good measure, there’s also a metal National Trust plaque fixed to the column. It made for a fitting 100th summit despite it’s relatively low height. Black Fell summit (known as Black Crag) with defaced National Trust plaque. Wainwright is not particularly known for his social commentary but his description of this summit is one of my favourites. As is often the case with some of the lower, easier to reach fell-tops, the trig column and the National Trust plaque have attracted a fair amount of graffiti over the years. Almost 60 years ago, Wainwright commenting on the plaque wrote: “This has been defaced by the scratched initials of visitors of the type who seem to see in this practice a chance of immortality. It must readily be conceded that, for people of such mentality, probably it is their only chance.” If only one were able to say such things today and get away with it! 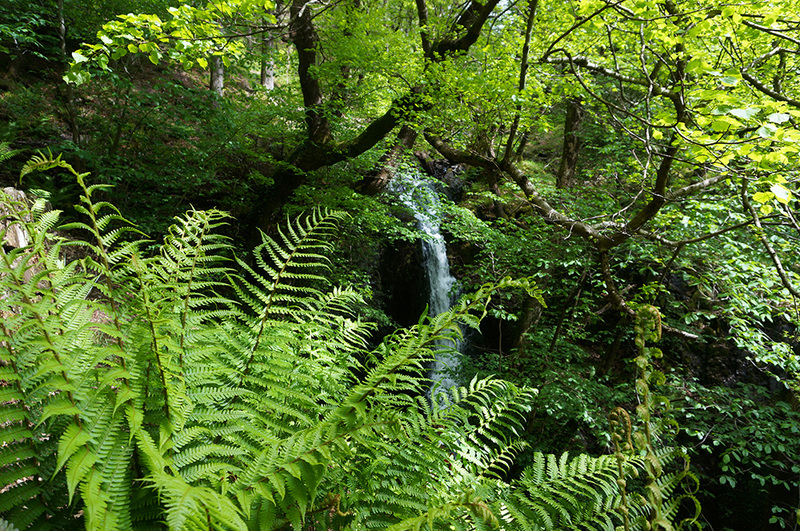 Ferns were a particular feature of this trip to The Lakes (Tom Gill waterfalls). The following morning was very wet but the forecast was for drier weather by lunchtime so I hung out in the new coffee shop in Ambleside and then headed back to Tarn Howes as the rain eased, aiming to bag Holme Fell. 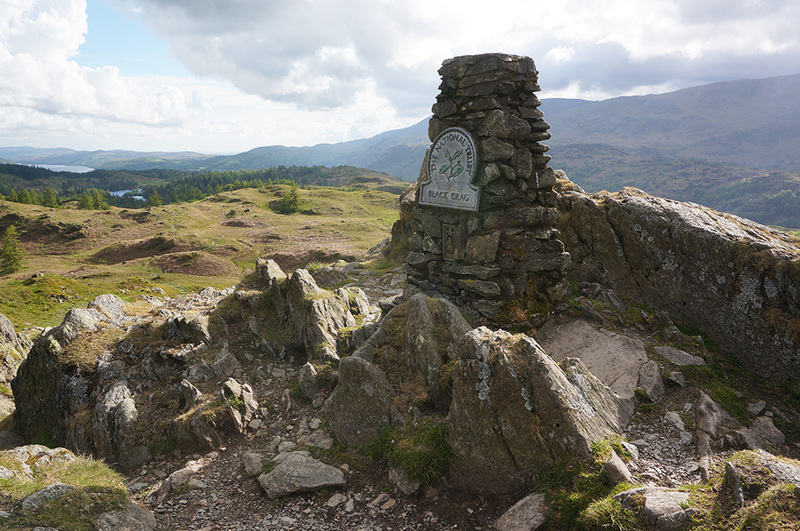 It wasn’t possible to combine Holme Fell with any other tops so I took it easy, getting to the summit in time for an early lunch and some great, clear views of Wetherlam and Coniston Water. After returning to the car, I went to Coniston and realised that I had probably never visited that small town before. 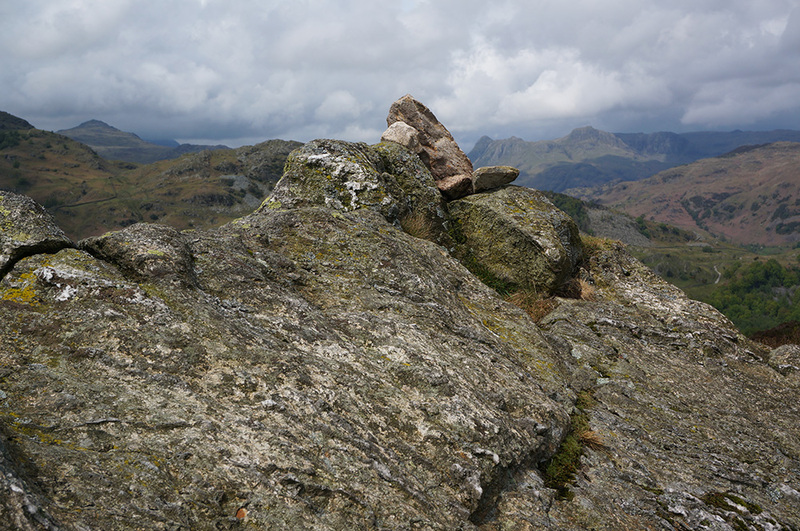 Volcanic rocks form the summit at Holme Fell. Monday was overcast but dry and I’d decided to take on a walk I’d originally planned a few years ago. In fact, it was the first Wainwright walk I had planned. Back in August 2014 we’d had a family holiday, staying at YHA Wasdale Hall and I bought Mark Richard’s Fellranger guide to The Mid-Western Fells. We had a lovely time there but I was frustrated that no one else shared my enthusiasm for climbing Whin Rigg and Illgill Head, so I never got to do the walk. Now I was going back to bag my 102nd and 103rd Wainwrights without the need to appease family. The view down Great Gully to Wast Water and Wasdale Hall YHA far below. I set off from Ambleside, trusting to the SatNav and not realising that I was heading for a dramatic driving experience. Had I looked properly at the map, I’d have realised that the most direct route is via both the Wrynose and Hardknott passes. I hadn’t driven the route before and wasn’t prepared for the white-knuckle ride. Yewbarrow and Wasdale Head from the path descending from Illgill Head. I was relieved to arrive at my destination with a still intact gearbox and swearing that I’d think twice before driving that route again. I parked up at the small car park at Cinderdale Bridge, Nether Wasdale. Curiously, the car park is not shown on the OS or Harvey 25,000 maps but is shown on the British Mountain Map. 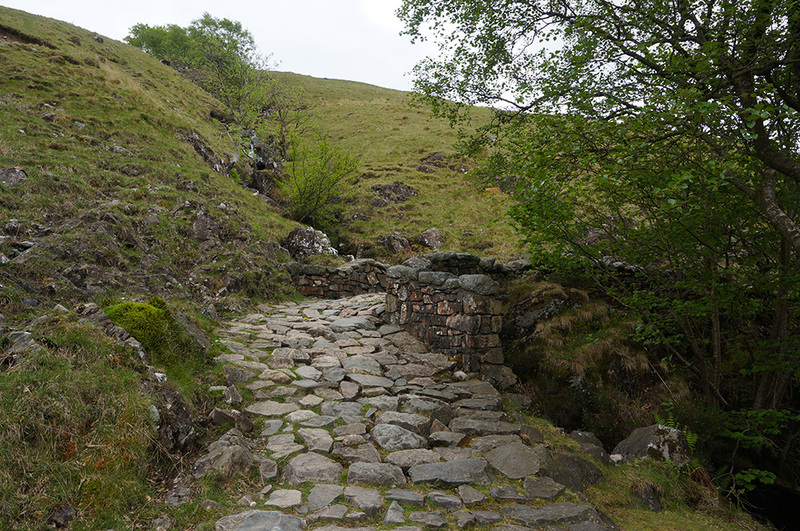 Beautiful, double-arch, stone footbridge at Hollow Gill/Groove Gill by Malcolm Guyatt. I was hoping to make this a relatively quick half-day walk as I had to drive home that afternoon and so I’d started early. Just after 9.00am I was booted and on my way to Whin Rigg. It’s a steep climb to the ridge, but from then on it was a pleasant, if windy, yomp. It rained a little on the way up but by the time I reached the summit, just before eleven, the sky was brightening a little. Views from the summit shelter cairn are excellent. Not only are there vertiginous views down to Wast Water and Wasdale Hall, there are also views to the Scafells, Great Gable and Yewbarrow. Kirk Fell, Great Gable and Lingmell from Wasdale Head. After a short break and a snack, I continued along the ridge path to Illgill Head. The cloud was still thick when I arrived but breaks were beginning to appear. Again, great views across to the Western and Southern Fells and during the descent, with the weather improving all the time, the sun began chasing cloud shadow across Yewbarrow and Wasdale Head. By the time I reached Guyatt’s lovely stone footbridge, there was blue sky overhead. 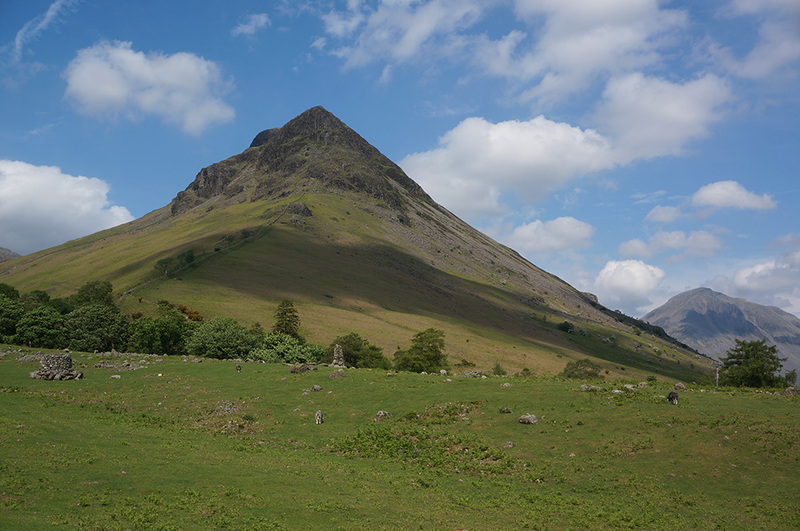 Yewbarrow looking Alpine in the afternoon sun. At Wasdale Head, I crossed the river and set off south-west on the return leg along the road. 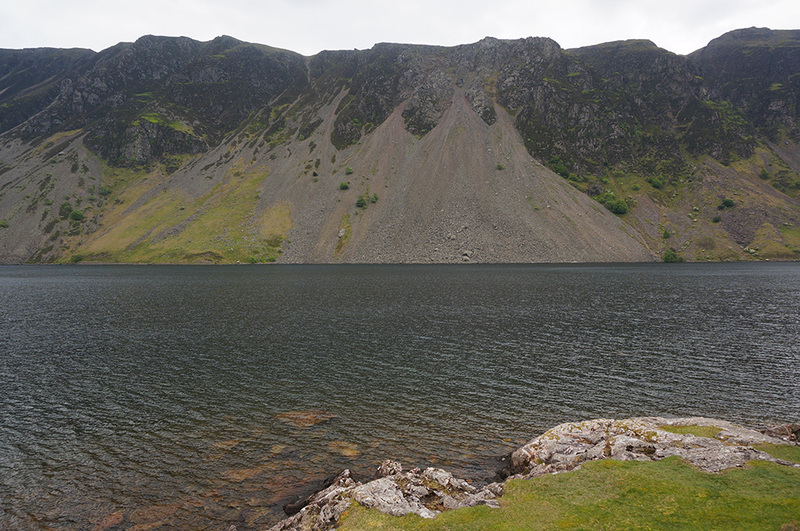 I was not tempted to take the shore path along the base of The Screes. 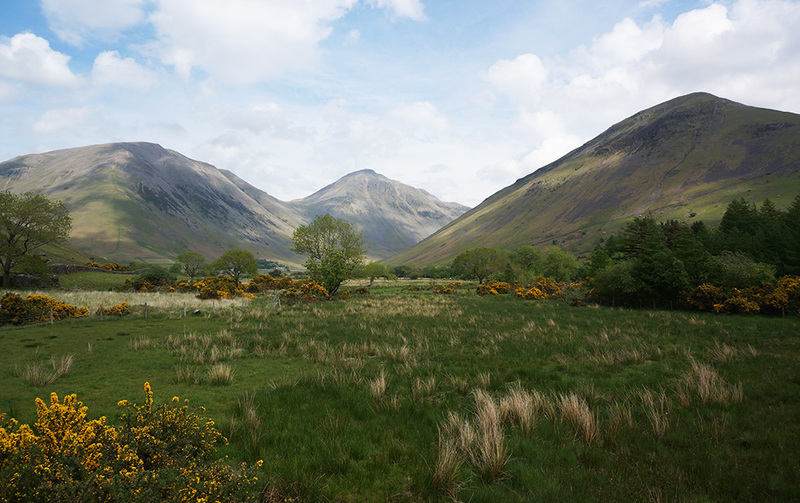 During our stay at Wasdale Hall I’d first heard and then seen a massive scree fall. Anyone in the way of that would have had no chance and although I guess such falls must be rare, the memory of the thunderous roar was enough to put me off. Wast Water Screes from the lake shore road. The day grew warmer and there were some lovely views back to Scafell Pike across the lake. At 6km, the walk along the road, although easy, seemed longer than the outward leg and it was 3 o’clock before I arrived back at the car. 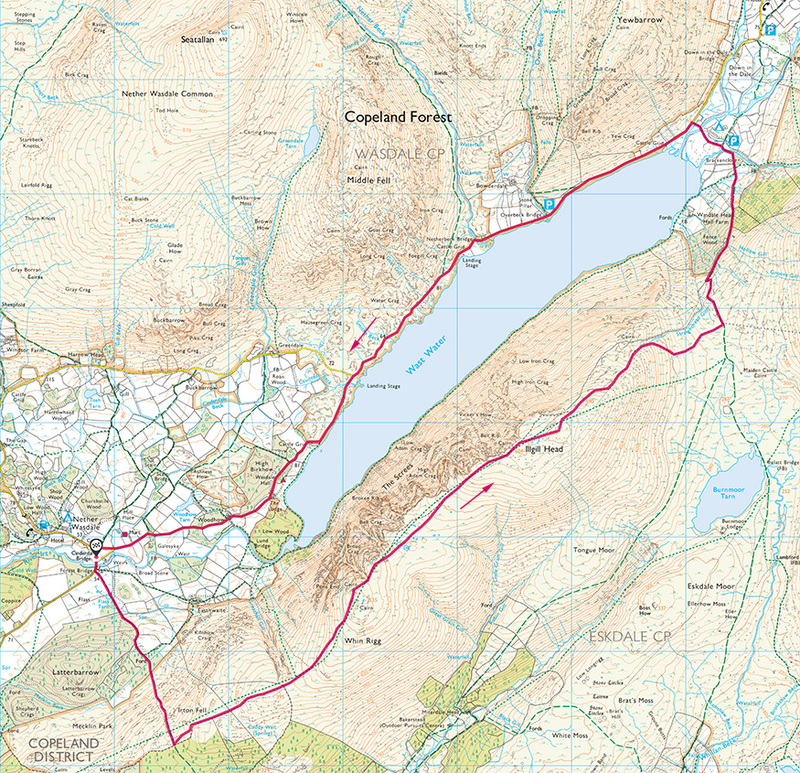 A Wast Water Round (17.4km and 766m of ascent). Start/end: car park at Cinderdale Bridge.